This coloured view shows of one of the walkways on the Pic Tor Promenade. What looks like tree roots on the left of the path is rustic fencing. Amongst Matlock's plans for celebrating Queen Victoria's Diamond Jubilee was that "the Hall Leys will be laid out, a bridge thrown over the Town Brook at Knowlestone Place, to below the Pig Tor Rocks, and from there on to the extremity of the district, joining that of Matlock Bath. The other side of the stream is also proposed to be developed similarly". The scheme was not properly agreed and implemented until 1902. The Council's Highways Committee visited the Pic Tor footpath in late 1913 and decided to fence off about 60 yards of the path beside the river. Although the Council appear to have used a metal fence on some stretches of the riverbank for a time (see Pic Tor, 1920) they also used this type of fencing, which was perhaps more sympathetic to the surroundings. We know the rustic fencing was still in place in the 1920s from a report about a storm in late 1928 when Matlock was affected by strong winds and very heavy rain. Whilst the storm was at its height it was practically impossible to stand. A huge tree on the Pic Tor cliffs was torn up by the roots and fell about 100 feet onto the footpath at the foot of the cliffs, which was blocked for a considerable time. The fallen tree demolished the rustic wood fencing on the river bank. Council workmen eventually cleared the pathway and presumably, although the newspaper report of the occurrence doesn't say so, repaired the fence. what is a shadowy area next to the right of the path in the top image. and is thought to date from the early twentieth century. 1. 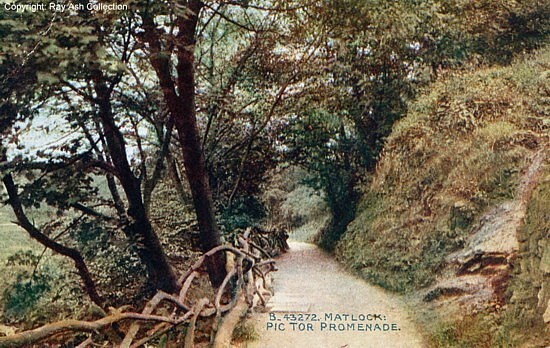 "Matlock: Pic Tor Promenade". Published by the Photochrom Co. Ltd, London and Tunbridge Wells. Printed in England, No. B.43272. Not posted. Probably dated about 1920. Postcard in the collection of, provided by and © Ray Ash. 2. 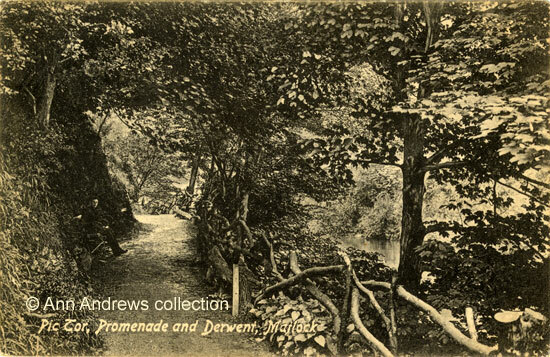 Pic Tor, Promenade and Derwent, Matlock	Valentine's Series, No. number. Printed in Great Britain Posted on 21 Aug 1916 at Matlock. © Ann Andrews collection..
Information researched, written by and © Ann Andrews. "The Derby Mercury", Wednesday, 2 June, 1897. "Derbyshire Courier", 13 December 1913. The Pic Tor Path. Meeting of Matlock UDC. "Derby Daily Telegraph", 24 November 1928.